Find places to stay in Rancho Cucamonga, CA and other fun things to do. View our list of attractions, activities, events, restaurants and visitor information. A hip vibrant lounge GÇö with mood lighting and a pink pool table GÇö is standard fare at Aloft Ontario - Rancho Cucamonga. The ultramodern four-story Aloft offers an eco-conscious amenities-laden stay with Wi-Fi available throughout the property. Free Internet, Swimming Pool, Restaurant, Pets Allowed, Non Smoking Rooms. Situated 11 km from Auto Club Speedway and offering free WiFi Beautiful Foothill Living provides accommodation in Rancho Cucamonga. The accommodation features a sauna.Fitted with a patio the units feature a flat-screen TV and a shared bathroom with a hair dryer. Swimming Pool,Outdoor Pool, Non Smoking Rooms. Located in Rancho Cucamonga Best Homestay offers accommodation with free WiFi within 3.5 km of Auto Club Speedway.All units feature air conditioning and a TV.The nearest airport is LA/Ontario International Airport 10 km from the property. Non Smoking Rooms. Free breakfast and free local calls are among the perks that make the non-smoking Best Western Plus Heritage Inn a top pick with our guests. The six-story Best Western offers free Wi-Fi throughout the property which is entirely non-smoking. Free Internet, Swimming Pool,Outdoor Pool, Non Smoking Rooms. Five minutes from shopping and offering free an on-site restaurant the non-smoking Courtyard Marriott Ontario - Rancho Cucamonga is a hit with our guests. Free Internet, Swimming Pool, Indoor Pool, Non Smoking Rooms. Travel with confidence at Fairfield Inn & Suites by Marriott? a hotel with outstanding service at an exceptional value. Nearby to the Ontario International Airport Citizens Business Bank Arena and the Ontario Convention Center. Swimming Pool, Non Smoking Rooms. 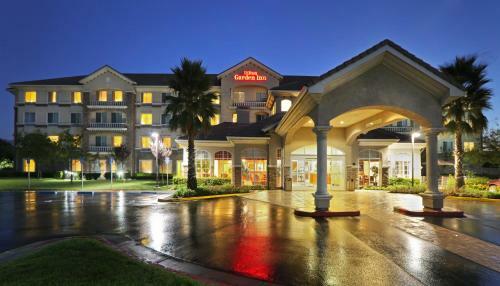 Our guests find an on on-site restaurant and an outdoor pool at the Four Points Sheraton Ontario - Rancho Cucamonga. The four-story Four Points impresses guests from the get-go with its sophisticated bright lobby area. Free Internet, Swimming Pool,Outdoor Pool, Restaurant, Pets Allowed. Free Wi-Fi attractive accommodations and a perch within walking distance of Ontario Mills Mall attract our guests to the Hilton Garden Inn Ontario/Rancho Cucamonga. Free Internet, Swimming Pool, Indoor Pool, Non Smoking Rooms. Free meals complimentary internet and spacious units attract guests to the Homewood Suites Hilton Ontario - Rancho Cucamonga. Free Internet, Swimming Pool,Outdoor Pool, Pets Allowed, Non Smoking Rooms. Set in Grapeland Modern House close to Park & ONT airport offers accommodation with a terrace and free WiFi.The air-conditioned units have a fully equipped kitchenette with a microwave and a toaster. A fridge and coffee machine are also available. Non Smoking Rooms. Conveniently located in Rancho Cucamonga the New Kansan Motel offers our guests a budget crash pad with free Wi-Fi and rooms with microwaves and mini-fridges. This single-story motel has 12 rooms with cable TV microwaves mini-fridges and complimentary Wi-Fi. Free Internet, Non Smoking Rooms. Free internet full in-room kitchens and complimentary breakfast make the non-smoking TownePlace Suites by Marriott Ontario Airport a fine choice for our guests seeking the comforts of home. Free Internet, Swimming Pool,Outdoor Pool, Pets Allowed, Non Smoking Rooms.